Florals? Bright colours? They’re on their way!! 2015 has begun and the new decorating trends look very exciting! At the upcoming Maison&Objet 2015 trade fair, where Mobile Diseño will be present, we will get a definitive overview of this year’s styles, but some firms are already giving us a sneak peek of the trends. 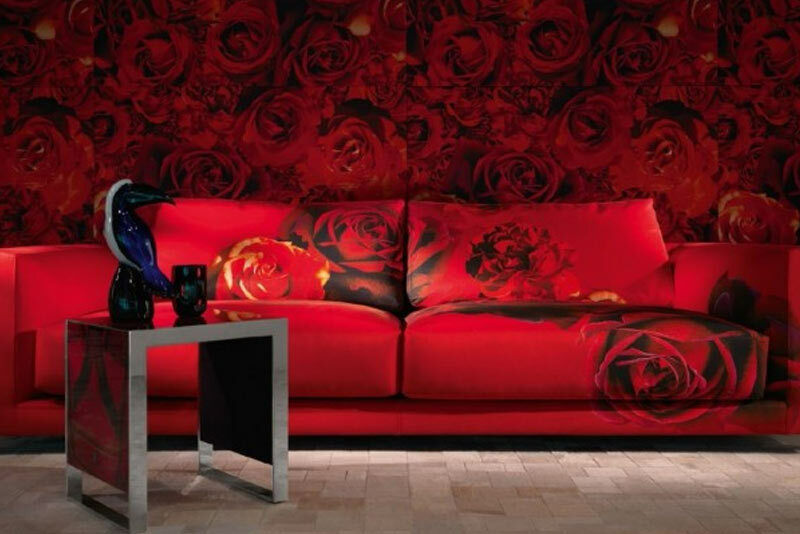 And of course the great fashion designer Roberto Cavalli is making a bold statement, with oversized roses on red silk. After years of subdued neutrals, soothing to the point of being depressing, in light tones (grey, taupe, white, etc.) an explosion of colour is arriving to cheer up our lives and our homes. Warm colours are stimulating, happy, exciting, and sometimes aggressive; the inclusion of large floral motifs emphasises their emotional impact even more. Warm colours in light tones (pink, salmon, etc.) suggest femininity and delicacy;darker tones, especially reds, suggest power, wealth and dominance.So companies like Blumarine Home and Roberto Cavalli Home are anticipating the trends with these ideas, with creations strongly emphasising a sensation of power and confidence. The advice of our interior design team is that pure red should not be used over large areas, where it can be overwhelming, but more as an accent to enliven gentler colours. Red is recommended for large north-facing rooms, as in small rooms it can be claustrophobic, attracting the attention and not allowing the gaze to travel around the space.It can be used in dark or cold rooms to create a warm, cosy atmosphere. Another major trend brings acid brights: yellow, orange, shocking pink, etc. If you want to update your home décor without spending a lot of money, our team recommends investing in rugs, table lamps, pendants and curtains in high-impact colours, to make your existing furniture look much more modern. And fun, colourful rugs by Carving. It’s time to get inspired and renew your home with exciting new colours!! Be sure to visit our showrooms where our professional team will be glad to advise you on everything you want for your home.